Edo G. is a legend in the world of independent and underground hip-hop. The Boston emcee has been creating honest hip-hop albums with an originality and individuality for over a decade. He believes that if he is simply himself on a record, people have to respect the truth in his performance. Without a fake image or gimmick, Edo G. has earned respect by being the same person on wax as he is on the street. In the early 90’s, the albums “Life Of A Kid In The Ghetto” and “Roxbury 02119” were released on PolyGram/Mercury under the name Ed O.G. & Da Bulldogs. After we went solo, he released the critically acclaimed independent album “The Truth Hurts” on Ground Control. With production by DJ Premier, Pete Rock and others, the “The Truth Hurts” LP gave Edo G. a whole new life in the world of independent and underground hip-hop. He also released the very slept-on “Wishful Thinking” too. With timeless collaborations on Masta Ace's "The Long Hot Summer” LP and on Guru’s “Bald Head Slick & The Click” LP, Edo G. has remained a solid emcee that consistently rocked mics. 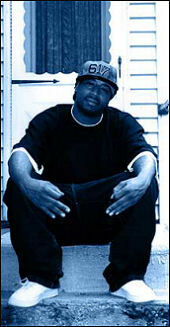 During the tail end of 2004, Edo G. returned with “My Own Worst Enemy” released on Fat Beats Records. With only 10 tracks, “My Own Worst Enemy” is an extremely tight LP that is short and sweet. Pete Rock produces 75% of the album while legendary producers Diamond D and DJ Revolution produce other songs. All of the ingredients of a solid album were mixed together to form something special. Besides the new LP, Edo G. has been a busy man. He runs a management company called Straight Up Management and is releasing a crew album by his group Special Teams. On a cold winter evening, I had a conversation with the legendary Boston emcee about jail, music, production, labels, and much more. Edo G. truly believes that the only person stopping him from following their dreams is the enemy inside himself. These days, Edo G. has remained victorious over the enemy within. Edo.G: Same sh*t. I’m trying to get it cracking, man. I’m working on a group album right now, Special Team’s project. Myself, Jaysaun, and this other cat from Boston. MVRemix: Your new album is called ‘My Own Worst Enemy’. Tell us about it. Edo.G: Basically, my man, Pete Rock produced around 75% of it. He’s on the album too. He’s on the track ‘Right Now’. Diamond D produced. He’s rhyming on ‘Streets Is Callin’. We got Masta Ace. My man Jaysaun is all over it. My man Krumbsnatcha is on it. My man DJ Revolution did the last joint on the album called ‘Revolution’. MVRemix: The LP is actually pretty short compared to most hip-hop albums out these days. Was that intentional? Edo.G: I just wanted to make something new, something really short and sweet that people could play and not get sick of. I didn’t want to make something with like 17 or more songs and 8 of them songs fillers and only like 5 good songs. I think people just over-do it now. MVRemix: What is the meaning behind the title ‘My Own Worst Enemy’? Edo.G: The title is basically this. You are your own worst enemy. Anything that you want to do, you can do. People can try to hate or throw roadblocks in your way. If you let that get to you, you can become your own worst enemy. If you want to do something, you can do it. No one can stop you but you. MVRemix: Pete Rock produced most of the album. How did that collaboration happen? Edo.G: Well, Pete Rock did something on my last album, ‘The Truth Hurts’. I worked with him on a joint called ‘Situations’. It came out real hot. I went to his crib and looked through a bunch of sh*t. He had a ton of hot beats. I told him, ‘I want to do some more work with you.’ I had the opportunity when my former manager gave me the idea. I called Pete Rock and he was down to do it. I called up Fat Beats and soon, everybody got on board. MVRemix: As a producer, how is Pete Rock’s creative process different from someone like Diamond D or the other producers on your album? Edo.G: Pete would make a beat right on the spot. He is just a total beat maker. That dude just loves making beats. You go to his house and you can just sit there for hours with him making beats. With him, the process is easy. You go to the crib, the basement, and just listen. He’ll play you some loops and if you like the loops, he’ll start hooking it up on the spot. He’s one of those types of cats. Diamond D just has a ton of sh*t. Premo. When I worked with DJ Premier on my last album, he gives you one beat. ‘You like it?’. If not, he’ll give you another beat. All the producers are different but Pete, he’s a good dude to work with. MVRemix: When you write a song, do you write from the beat or do you have pre-written lyrics or thought out themes ready? Edo.G: Sometimes, I have lyrics that are already written that may go to a specific beat but most of the time, I just get the track and take it from there. MVRemix: How did you hook up with Fat Beats to release ‘My Own Worst Enemy’? Edo.G: That was the first company we brought the project to. They agreed to the terms we were looking for so, we just ran with them. We wanted to make the project happen. We didn’t want to go through a long process of trying to get a deal for it. The LP still took a long time. MVRemix: Out of the many albums you released, which one is your favorite? Edo.G: I love ‘The Truth Hurts’ a lot. I put out an EP in 2002 that had 8 tracks on it. I loved that one too. I love this record, ‘My Own Worst Enemy’. I cannot really pick just one record because they are all different and I love them all. My least favorite is ‘Roxbury 02119’. I had some dope stuff on there but I had some ‘whatever’ sh*t on there too. The last couple of albums I released are the ones I am really excited about. MVRemix: Do you have a favorite song on ‘My Own Worst Enemy’? Edo.G: I think ‘Just Call My Name’ is my favorite song. I love that beat. We did it at Unique Studios in New York. They closed down a while back. It was right in Times Square. We just had it blasting. It was turned up as loud as it could possibly be. To hear that beat as loud as you possibly could hear, it was a really crazy experience. The speaker wind was hitting you in the face! It was that loud. "I just wanted to make something new, something really short and sweet that people could play and not get sick of. I didn’t want to make something with like 17 or more songs and 8 of them songs fillers..."